Quail Ridge features an 18-hole championship spread, designed by Michigan's own renowned architect, Raymond Hearn. The course features five sets of tee boxes to suit your players, regardless of their level of experience, talent or expectations. Everyone can choose the challenge that fits them best. We are pleased to offer our local golfers looking for a place to call "HOME". Our golf course is perfect for golfers playing a lot of golf while enjoying a great golf golf experience. 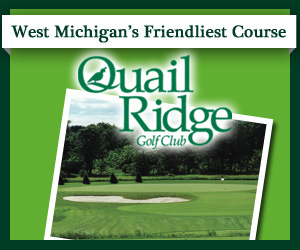 Quail Ridge is considered one of the finest golf courses in the Greater Grand Rapids area. For more information please submit a "request" for membership information and we will be in touch in short order. Quail Ridge's unique layout has some of the most outstanding scenery you'll find for miles around. Your guests are sure to love the rolling meadows, marshes, and ponds. The clubhouse can accommodate up to 200 people. There is a plethora of menu options to choose from, or work with our staff to create your own menu. For more details, check out our menu options page. The scenery is definitely part of the excitement when you hold an important party or celebration. That's why Quail Ridge, with its rolling fairways and lush green lawns, makes the perfect setting for events of all kinds. If it's a wedding you have in mind, remember the important rule: Something old, something new and something with a view. You can stage your ceremony on our grounds or in our dining area. You'll find that photographs taken amid our scenic surroundings will create priceless memories of your special day. Please watch our wedding video! Our dining room can hold up to 200 guests and can be rented for receptions, anniversary celebrations, birthday parties, office holiday festivities and similar events. This is also an outstanding location for business meetings and seminars. And whatever your event, we make it easy for you to enhance it with a small golf outing here at the Friendliest Championship Course in West Michigan. Contact Quail Ridge Golf Club at 616-676-2000. Contact Quail Ridge Golf Club at 616-676-2000 for onsite or nearby dining options. Watch the Quail Ridge Golf Club Video. This profile was last updated on 12/21/2016 and has been viewed 8,451 times.